This ring shows the Claddagh, it is 10ct yellow gold. Made in Ireland. This ring shows the classic Claddagh symbol. The hands represent Friendship, the heart Love, and the crown Loyalty. 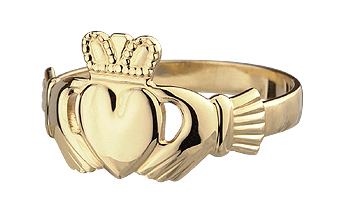 This claddagh is a flat heart version of the ring. Meaning the heart is not puffed at all. Click here to see the puffed heart version. We do try to keep most sizes in stock, but if not in stock may take 3-4 weeks for delivery. Please call or email us for an exact lead time if required.